Excellent! The weather was iffy, so it was great to see that the field was set up for BP. 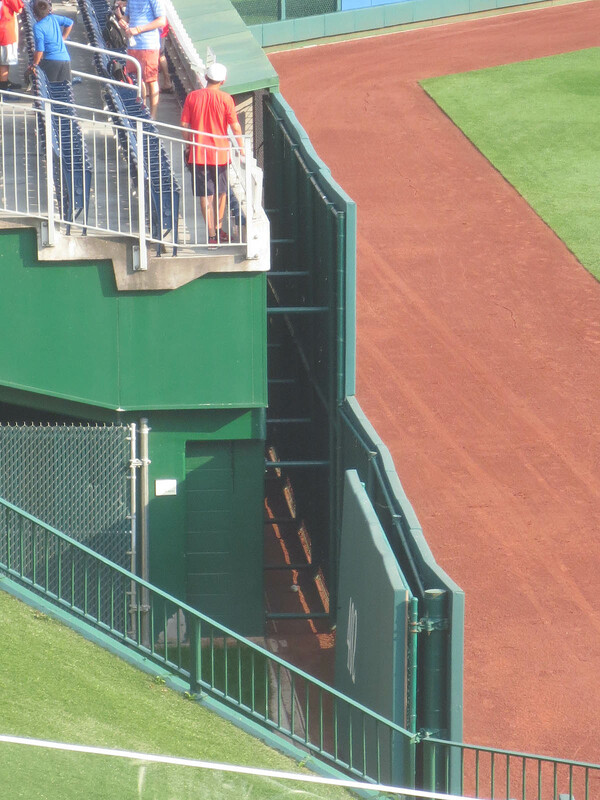 That photo shows the center field gate, and if you look closely, you can see my friend Ben Weil on the sidewalk. He’s wearing a white t-shirt and standing triumphantly with his arms in the air. 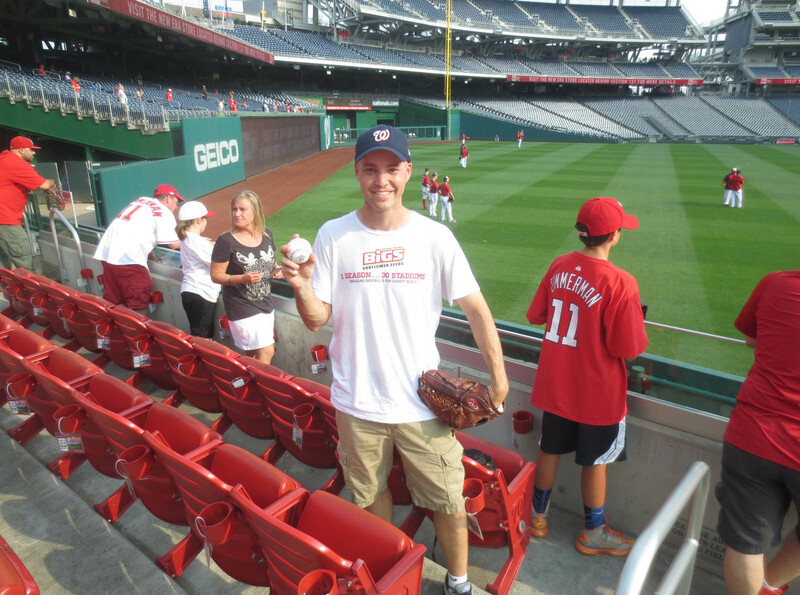 At 4:30pm, the stadium opened, and by 4:33pm, I’d snagged my first ball — a home run that I think was hit by Gio Gonzalez. 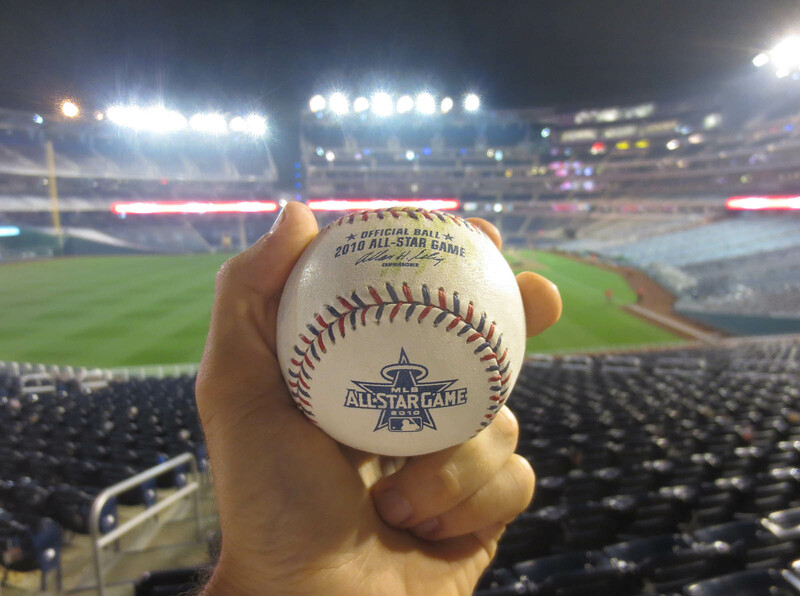 I was in straight-away left field, and when I grabbed it in the seats, I pretty much freaked out because it was a 2010 All-Star Game ball. Modami is perfectly friendly, but ever since he figured out who I am and heard about my collection, he stopped giving me baseballs. I can’t really blame him, but now I needed his help more than ever. I asked him if it were true that the Nationals were using 2010 World Series balls in BP. He said yes and mentioned some of the other commemorative balls that that he’d seen. I told him I already had all the others and that I was *dying* to get a 2010 World Series ball and that I’d driven down here from New York just for the purpose of getting one. As luck would have it, the batter promptly hit a ball to Modami, who fielded it and inspected it. It was an offer he couldn’t refuse, and to my delight, he threw me the ball. The logo wasn’t perfect, but it wasn’t THAT bad. Nevertheless, he offered to get me a better one. (Was I dreaming? Had I died and gone to ballhawking heaven? Oh wait, I don’t believe in heaven.) There were two kids shagging near him, and for the next few minutes, whenever either of them fielded a ball, Modami got them to throw it to him, and sure enough, he inspected them all. Unbelievable. Eventually he got his hands on a good one and looked in my direction. I thought he was simply going to swap balls with me, but instead, he told me to give the crappier ball to the fan on my right. As soon as I did that, he handed the better World Series ball to one of the kids on the field and told him to run over and toss it to me . 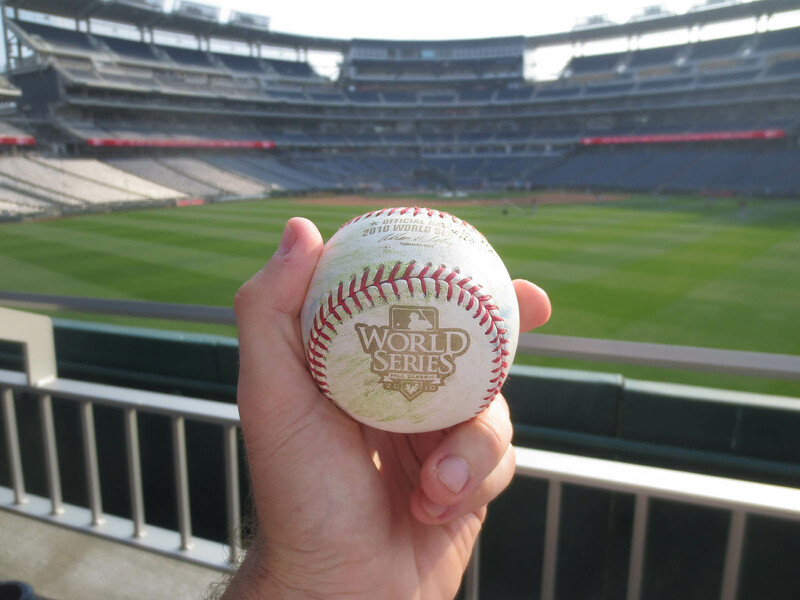 . . and just like that, I had a brand-new 2010 World Series ball (with the word “practice” stamped on the sweet spot). It was too good to be true. For the record, I decided NOT to count both World Series balls toward my grand total because (a) the second ball was a replacement for the first one and (b) I knew ahead of time that I could give away one to get another. If, hypothetically, I’d given away the first one without being asked and Modami happened to witness it, and he decided to give me another ball as a reward, then I would’ve counted both. Do you understand the difference? It’s subtle (and yes, totally arbitrary), but I do have my reasons for counting certain balls and not others. Ultimately I try to make the “right” decisions that reflect my effort/achievement without falsely padding my stats. So again, just to be clear, the way I saw it, I had snagged *two* baseballs by this point in the day, bringing my lifetime total to 6,998. Is that a beautiful sight or what? And yes, the third ball was from the final season of the Metrodome. 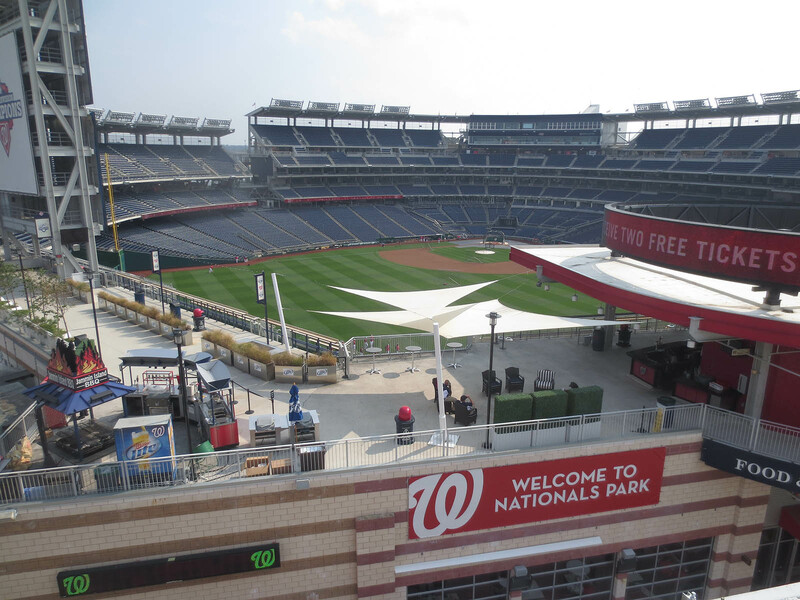 Why are the Nationals using all these balls? My guess is that Rawlings had a surplus and sold them cheap. 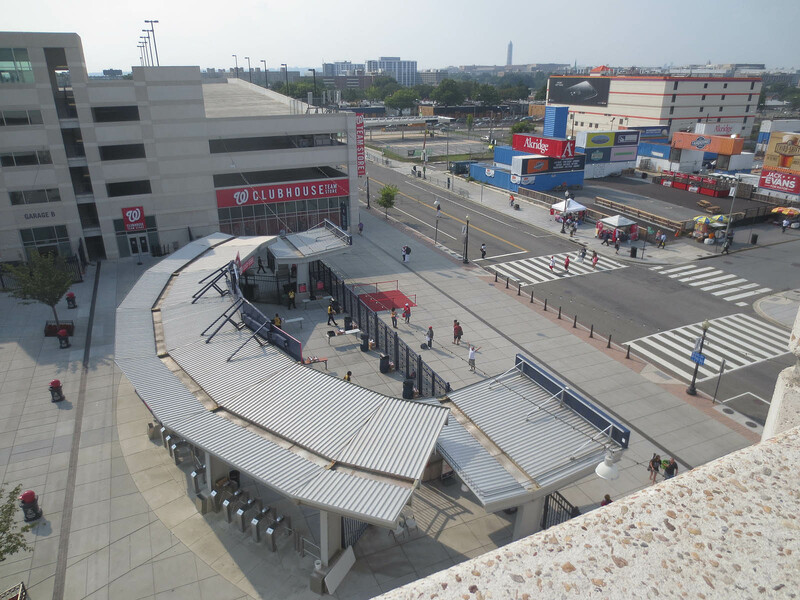 Years ago, the Mets got all the leftover commemorative balls — that’s how I snagged my All-Star balls from 2005, 2006, and 2008 — and now the Nationals seem to have them. Lucky me. I’ve made a point of snagging all these balls at different stadiums. I’m hoping to get No. 10,000 at Camden Yards, and I’d like to get No. 8,000 and No. 9,000 outside of New York City. I feel like Philly is due for some milestone love, even though they don’t love me, but whatever, I have two years to figure it out. Here I am with my 7,000th ball . 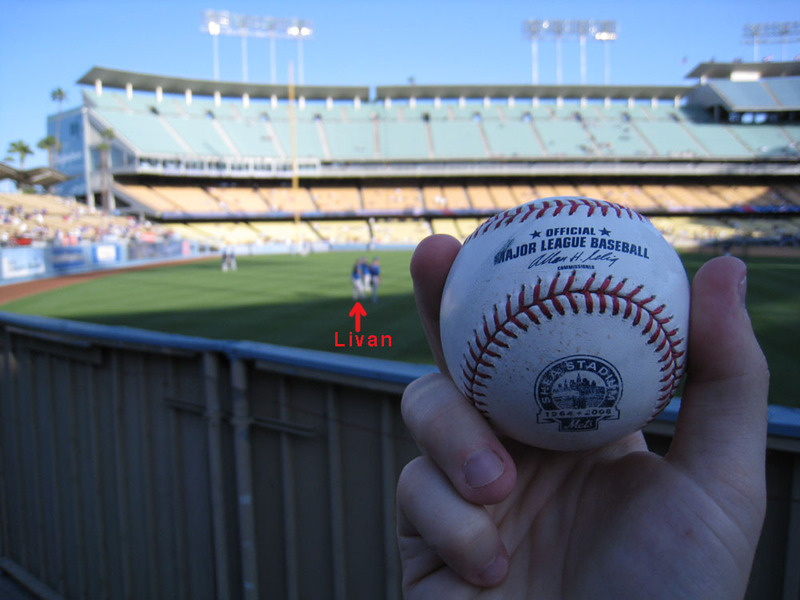 . .
It’s weird to achieve a milestone in 2013 by catching a ball from 2010, but hey, that’s just how it all worked out. My fifth ball of the day was a line-drive homer that I caught on the fly in the front row in left-center field. 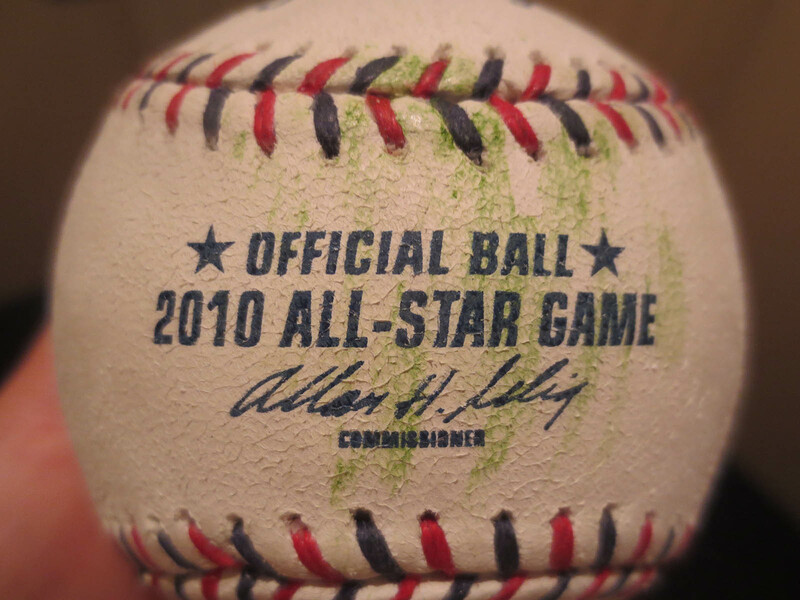 I have no idea who hit it, but I can tell you that it was another 2010 All-Star Game ball. I didn’t “need” any commemorative balls from Minnesota, but it was still fun to catch them. 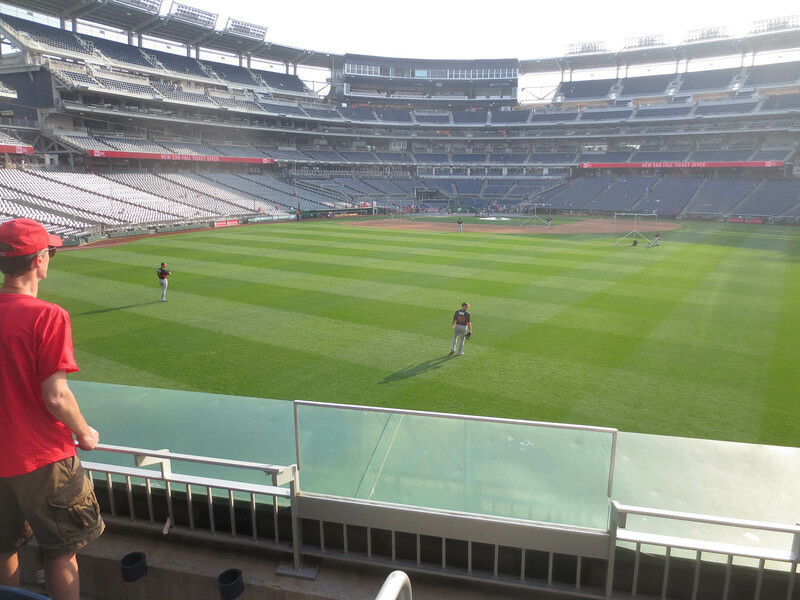 Here’s a photo that I took after the Nationals’ portion of BP ended — can you find the ball? In the photo above, the player standing in front of me is Mike Dunn. He had tossed it to me, and when I saw the logo, I handed it to a kid on my right. 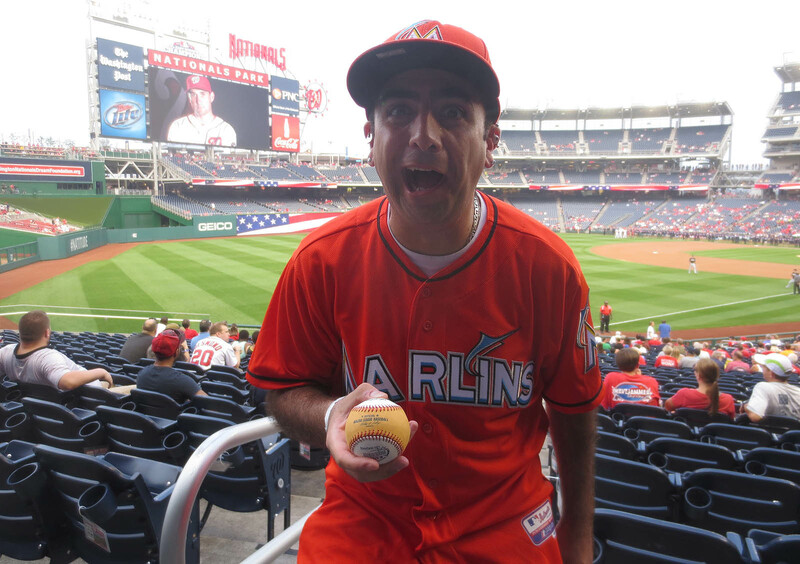 My ninth ball was a homer by Christian Yelich that landed in the seats in right-center and ricocheted in my direction as several other fans were closing in on it. 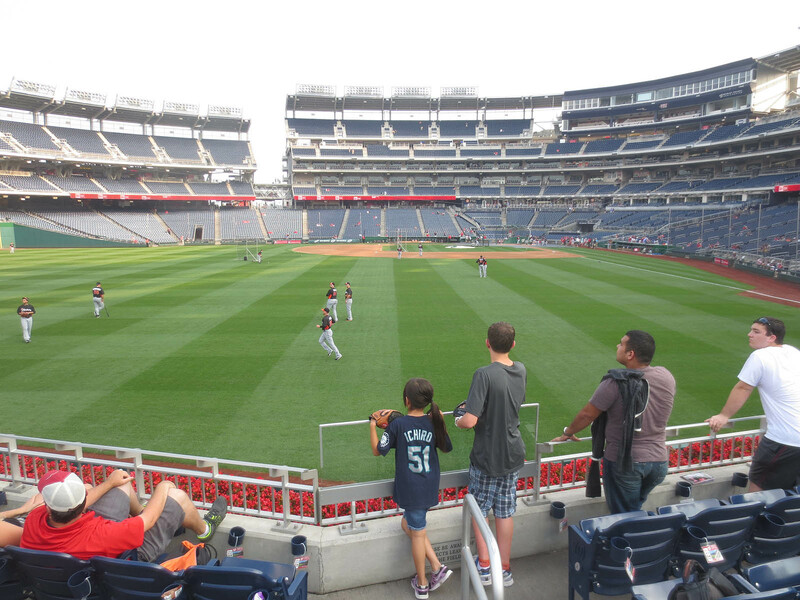 Two minutes later, I reached double digits by grabbing a Logan Morrison homer in the seats. That one was pretty simple — a line-drive shot that I read well off the bat. I darted two rows back while the ball was in mid-air and then cut across toward the spot where it ended up landing. Of course, I was still kicking myself for the two Jayson Werth homers that I’d misjudged earlier, and there were others that I coulda/shoulda caught. If I’d done everything right, I might’ve ended up with 20 balls by the end of BP. 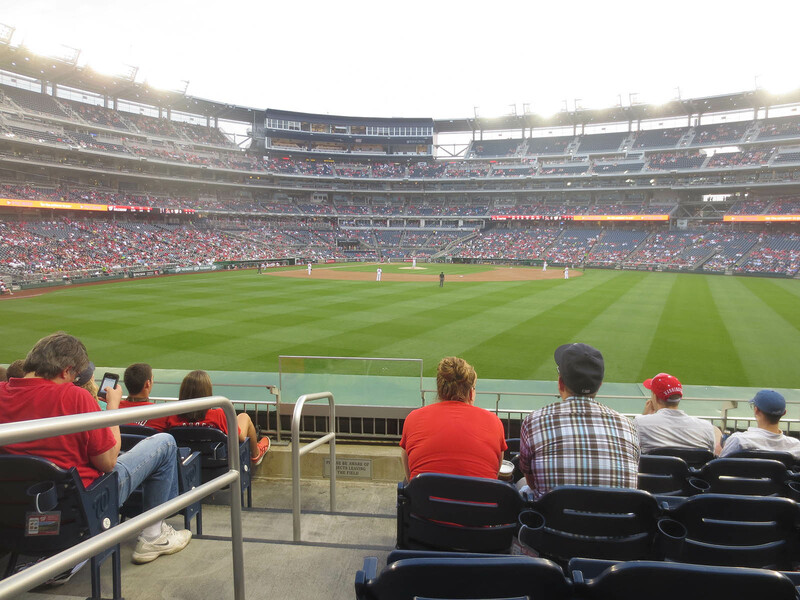 At around 6pm, I headed back to left field . . .
My 11th ball was thrown by Arquimedes Caminero, and it was very lucky. I was standing in the front row behind the bullpen when he chuckled it (from the warning track) to a middle-aged woman on my right. The ball clanked off her bare hands and skipped off the railing in my direction. Instinctively, I lunged for it and managed to glove it before it plopped down into the bullpen — and then I handed it to her. 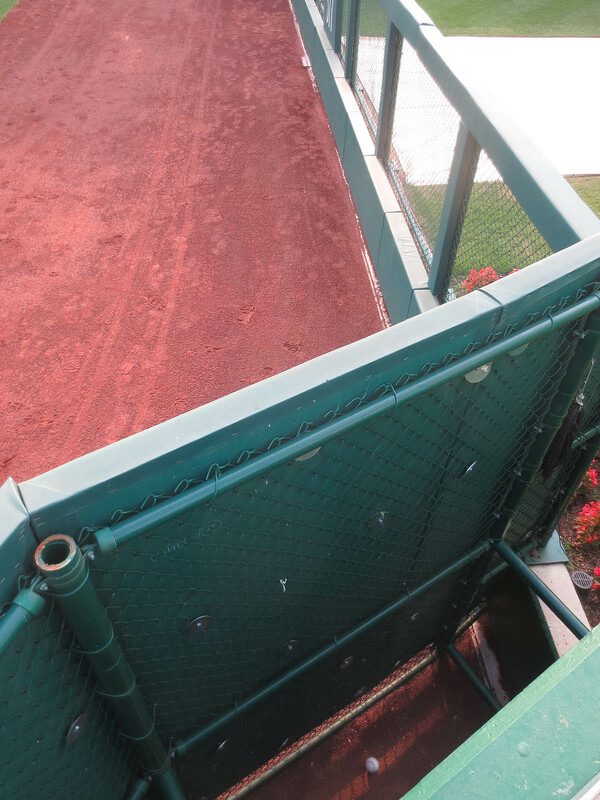 After BP, I used the trick again to snag my 13th ball from the bullpen. 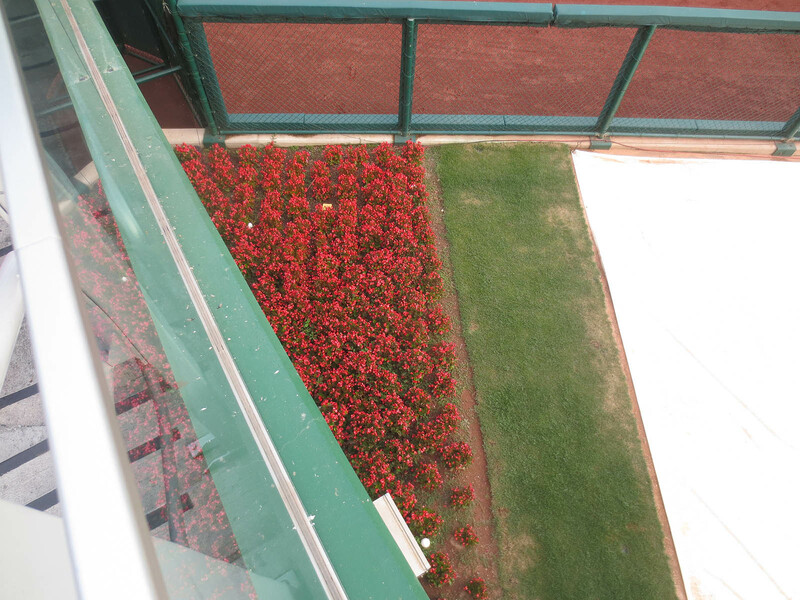 In the following photo, there are two balls in the flowers; I got the one directly below me . . .
. . . and gave it to the nearest fan. That’s a gold ball from the 2010 Home Run Derby. 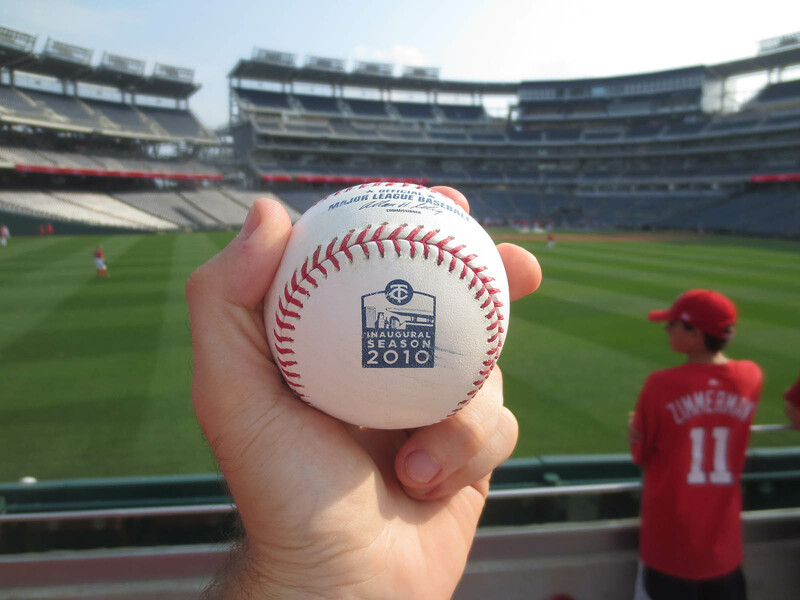 It wasn’t actually used during BP; Modami had told one of the kids to hook Ben up after BP, so when the whole stadium opened at 5:30pm, Ben hurried over to the seats behind the Nationals’ dugout, and somehow the kid (who had gone inside for a few minutes) appeared with that ball in his hand. That’s insane, and you know what? Ben wins. I don’t know WHAT he wins. He just wins. All-Star balls and World Series balls are nice. The logos change every year, and it’s fun/challenging to snag them, but getting a gold ball from the Derby? Are you kidding me?! Here’s where I sat for the first half of the game . . . While I was in the outfield accomplishing nothing, Ben got two 3rd-out balls behind the Marlins’ dugout, bringing his total for the day to 11. 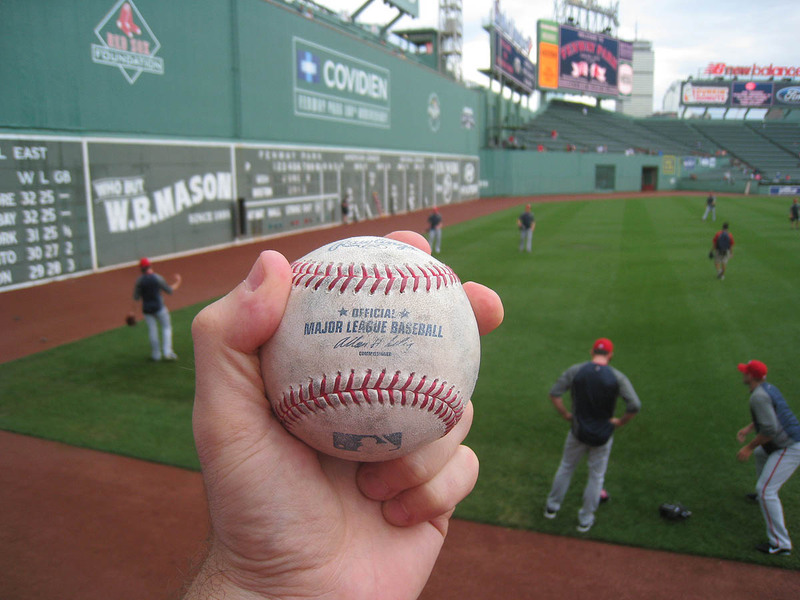 In the 9th inning, I moved beside the Marlins’ bullpen . . .
. . . and after the final out, I got bullpen coach Reid Cornelius to toss me my 14th ball. 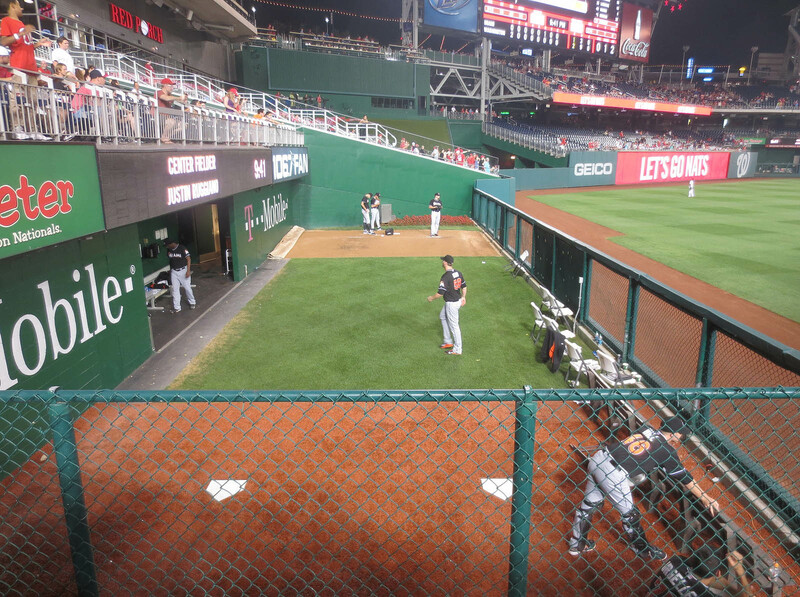 Final score: Nationals 2, Marlins 1. 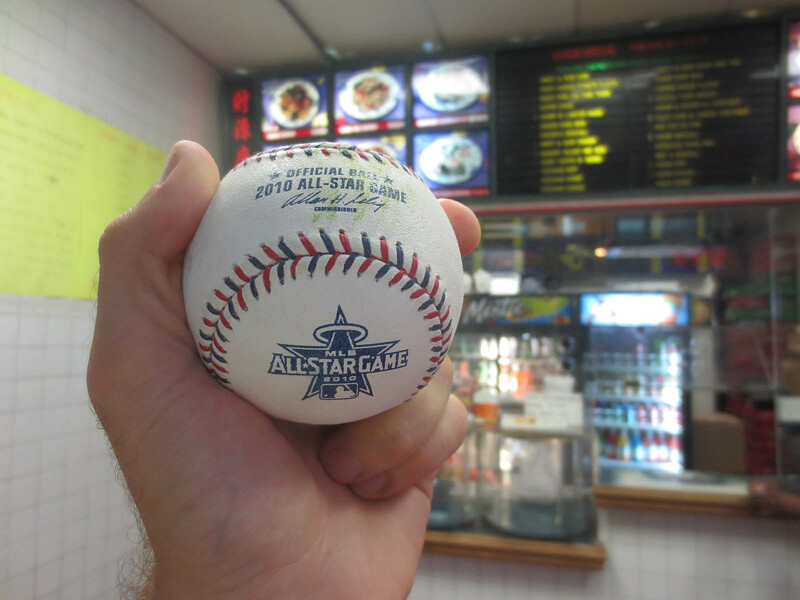 Here’s the ball at a nearby Chinese restaurant . . . In case you’re wondering, Ben was not naked. He was wearing shorts. And gold chains. Here’s a closeup of the ball . . . The Nationals might be my new favorite team. Just kidding. Go Diamondbacks!! But seriously, what a day. 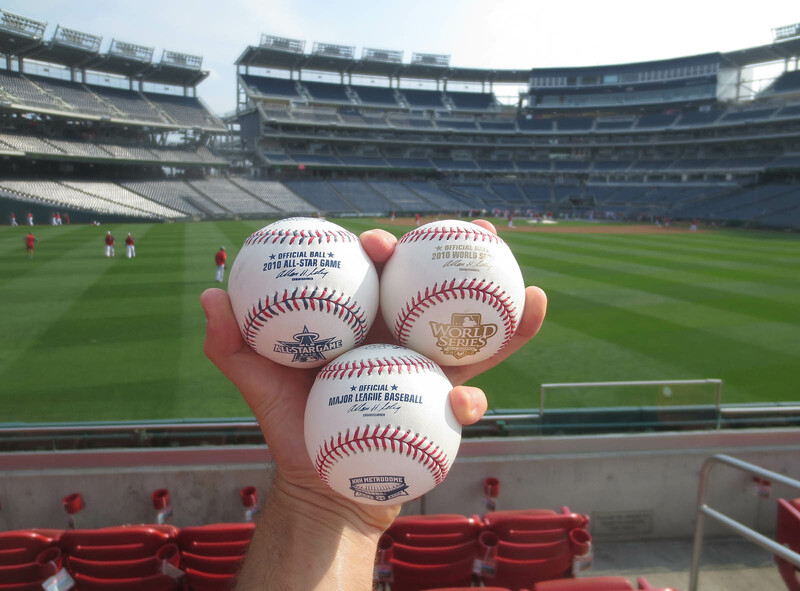 I wonder how long the Nationals’ supply of commemorative balls will last . . .
• 551 balls in 73 games this season = 7.55 balls per game. 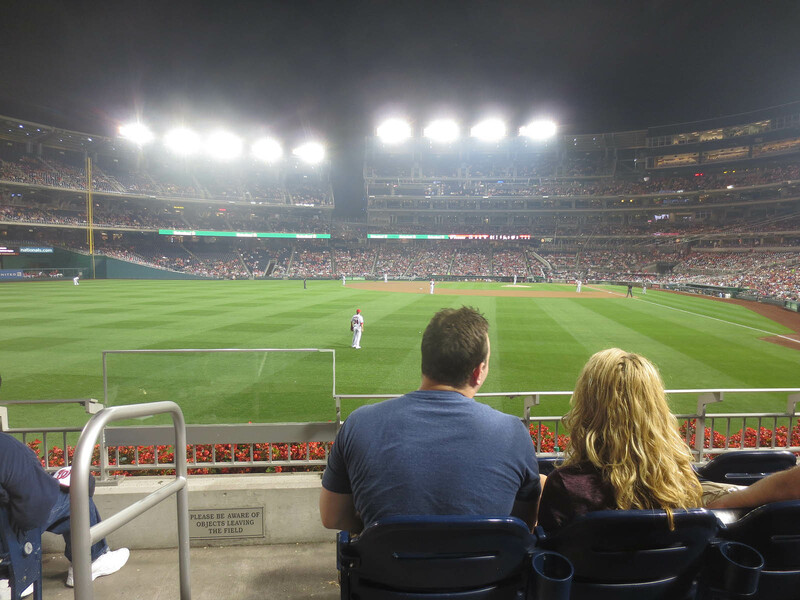 • 275 balls in 20 lifetime games at Nationals Park = 13.75 balls per game. Yay! I win, and I’m special! To those who haven’t watched the video, watch it, it’s impressive. Also, Zack, you definitely downplayed a few of those catches you made. Nice efforts, all day long. And everyone: Be happy you can’t zoom in on my bare chest! Yo zack, are all teams using commerative baseballs right now? Ill be at Astros vs Mariners this Saturday at Minute Maid, you think they will be using any? Are you going to get Rendon to sign #7000? Congrats on the big 7triple oh Zack! The irony being that you getting it at a place where you were ejected, quite controversially I might add. 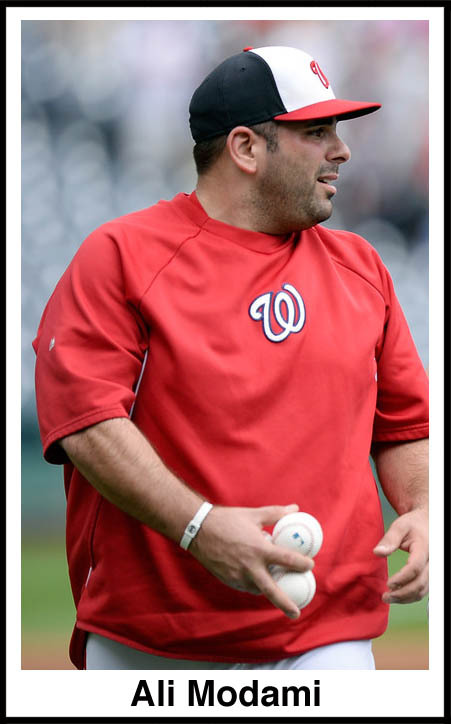 And I’m going to guess that you’re going to try and get Rendon to sign your ball? Let’s hope he’s not a jerk like Rios. Wow, man, congratulations! And to think all my life I thought getting *one* ball was impossible. Rawlings indeed must have crazy overstocks on commemoratives … they have an outlet store near Disney that had a $5 bin a couple years back with various commemoratives as well as some weird stuff (balls done for a memorabilia company for autograph sessions, a real odd one – and MLB with laser cut letters indicating it was some kind of Fenway Park prize ball). 1 – Pop-up adds on the blog?! Say it ain’t so Zack!!! 2 – What are the tags zip-tied to the cupholders in the exterminator pic? Well done, Zack! Of all the years I’ve gone to games, the only commemorative ball I got was a 1996 AS ball (Phillies) at AT&T park at Opening Day about 10 years ago…funny thing is they didn’t play the Phillies either. That picture with Benny and his Chinese food in the background might be the single best photo to ever appear on a blog in the history of the world. Also, I think that the Metrodome ball is my favorite season long commem of all time and the 2010 All-Star ball is my favorite All-Star ball — well, the 1979 50th All-Star Game ball is better, but let’s just focus on the modern era of commems. Pretty sweet that you got both at the same game in 2013! And nice videoing. Move over DodgerFilms, here comes HampleFlix. Congrats. That pic of Ben in the hotel is just smoking hot. Congratulations. Awesome haul Zack. Memorable day at the stadium that had previously ejected you. If any balls were going to be sold it would be those commemoratives. By the way , be careful , your atheism is showing. Congratulations Zack! Do you have your very first ball? If so, can you post a picture? Leigh, I expect to see a picture like that of you next time Zack visits San Diego! Ray, be happy you can’t see my stomach clearly, then you’d see some real atheism! Congratulations! No matter how you look at it, it’s quite an accomplishment. And all the money raised makes your accomplishment more relevant to those who benefitted from the donations. Re: gold ball, did Ben ask for that specific ball? Just wondering how he got it & yes, he wins the top prize! Ha. Thanks. Great hanging with you again, as always. All teams? No. 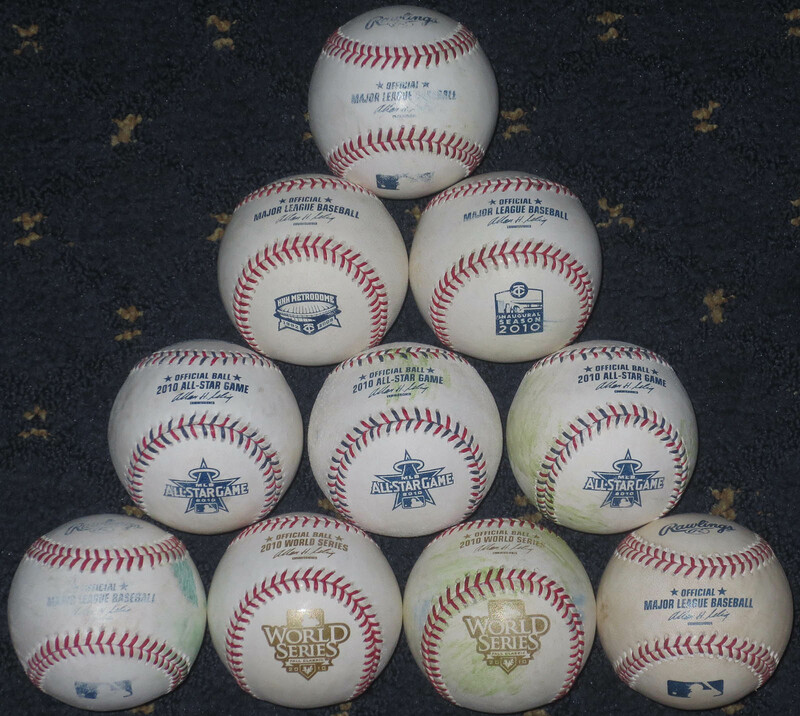 The Astros and Rockies are using commemorative balls this season during all their home games, and in some random cases, teams might have random commemoratives, but that’s hard to predict. I’m going to try with Rendon. Never did get Lidge. Thanks. I think about that ejection often, but it doesn’t help to stay mad. If you hear anything about Rendon’s personality, let me know. Thanks. I used to think that it was (nearly) impossible too. 1) Are there pop-up ads? That’s annoying, but I have no idea. That’s all MLB. I use AdBlock Plus, so I don’t even see the banner at the top. 2) Those provide info for ordering food directly to the seats. I actually saw someone do it (during the game) for the first time. That’s a pretty cool ball to have. I wish I’d gotten one of those. I’m glad you feel that way. HampleFlix, huh? That has a nice ring to it. I’m not sure which ball it is, unfortunately, but I do still own it. Thanks. Ben didn’t ask for it. He headed over to the dugout to get a different commemorative ball from one of the players’ kids . . . and the kid just happened to appear with it. All I can tell you is that Rendon does sign autos, YouTube has confirmed that. so I guess that counts for something. Try and get into contact with him, he might be willing to do you a solid. Wow, what a day! I had tickets for the 28th and was PUMPED when I saw your tweets about the commemorative balls, but as luck would have it rain cancelled BP on Wednesday. 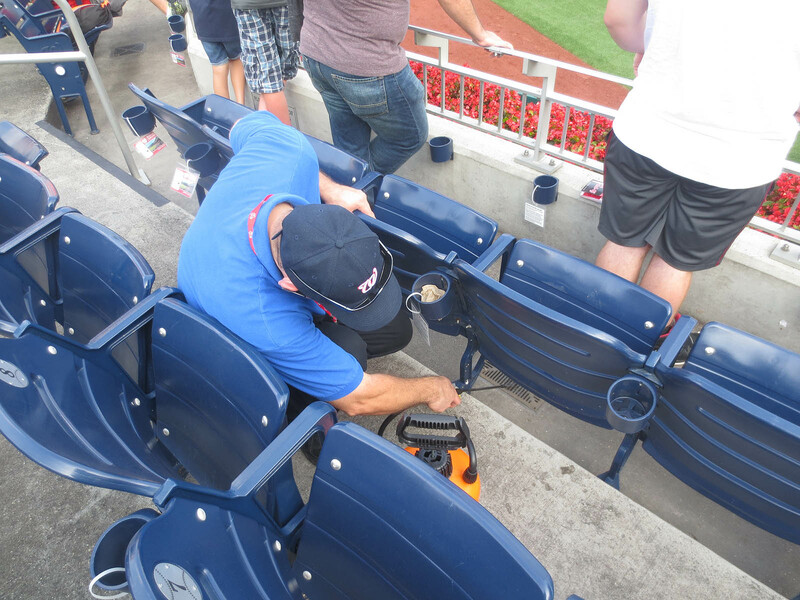 Anyway, I saw that exterminator guy in the same area before the game spraying all over the place. It was weird. I concur with Todd, the pic with the hirstute Ben in the background with what appears to be enough Chinese food for a family of 10 is priceless. Congrats on 7,000! I also loved that 2009 Metrodome ball. That is the only year I ballhawked so it holds a special place in my heart. Thanks. Lidge never blew me off. I just never got the chance before he was released. I wonder where he is these days. The Nats are coming to Citi Field in a couple weeks, so hopefully I can catch up with him then. I was planning to attend the game on the 28th as well, but I bailed when I realized how crappy the weather was. Hopefully you’ll get another shot to snag some of those balls. Indeed, there *was* a lot of food, but we deserved it. It was a celebratory meal. Disturbing . . . in a good way? When is the next game that you’re going to? Congrats on #7,000! That’s a huge milestone! 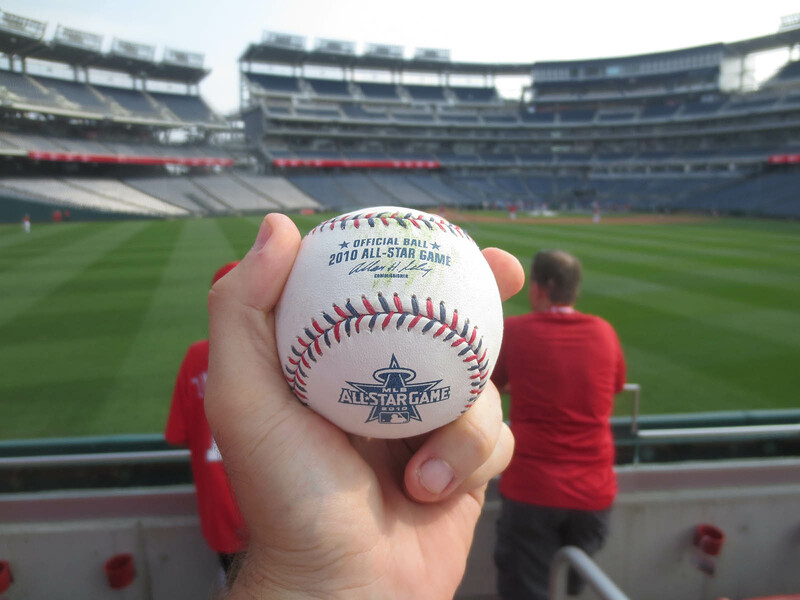 It’s awesome that it’s a 2010 ASG ball too! I’m hoping to make a trip out to DC around this time next year, as it seems they go commemorative crazy in Late July/August/Early September. On Friday in Oakland, I got 8 balls in BP, which is a new record for me. I came close to several foul balls, but had no luck. 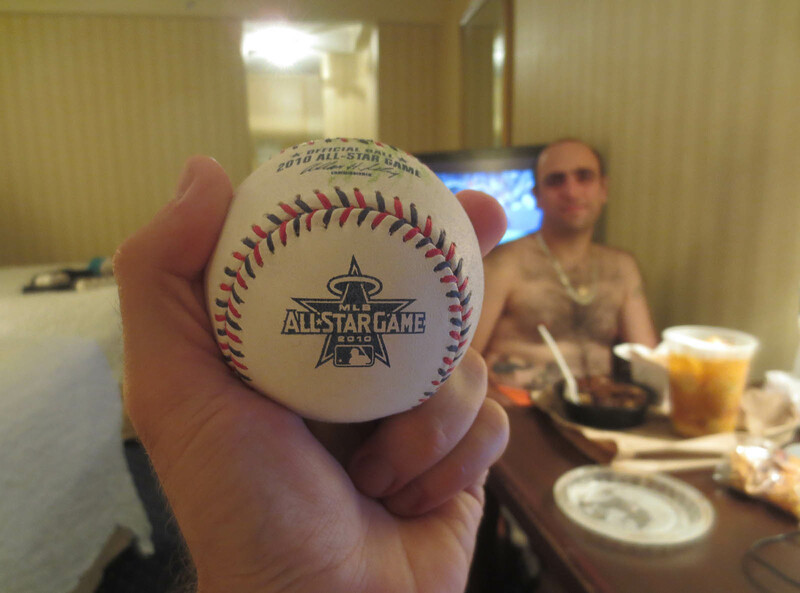 One of the balls I got was my 100th of the season between MLB and MiLB and I didn’t realize it until I got home, but I gave it away… Jose Molina said he’d toss me the ball only if I found a kid to give it to, which I did. He ended up tossing me another ball after that, but it still is kind of frustrating that I gave away the ball. Sorry, but I don’t sell my baseballs. Hopefully you can track down one of those World Series balls somewhere else online.